There were good trades in gold and modestly profitable trades in the ES this week using Nat’s inflection points, but this oil trade on Thursday Jan. 31 was head and shoulders (technician’s joke) above the others. Click the chart to enlarge. It returned a potential gain of about $1,700 per contract for a trade that was in the market for about five hours. To make it even sweeter, Nat’s first sell level caught the last dime before the reversal from a rally that lasted most of the week. The maximum drawdown was measured in pennies. The call was posted on Nat’s website overnight, and was easily executed with a limit order set in advance. The exit strategy would determine the actual profit; an exit at the day session close would return about $1,600 per contract. 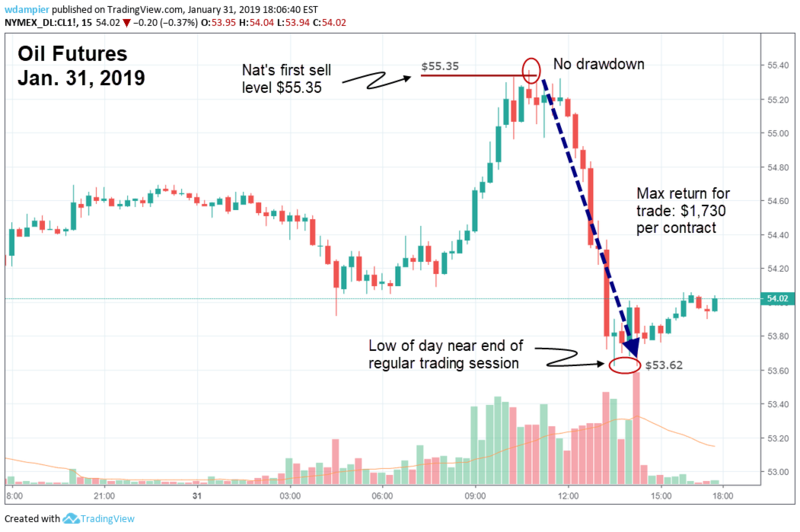 For traders with a longer time horizon, an entry in oil using Nat’s buy levels posted Sunday night returned about $4,000 per contract for the week.